April 1815 returns us to dresses of white, with both a white satin evening gown and a white muslin morning robe. 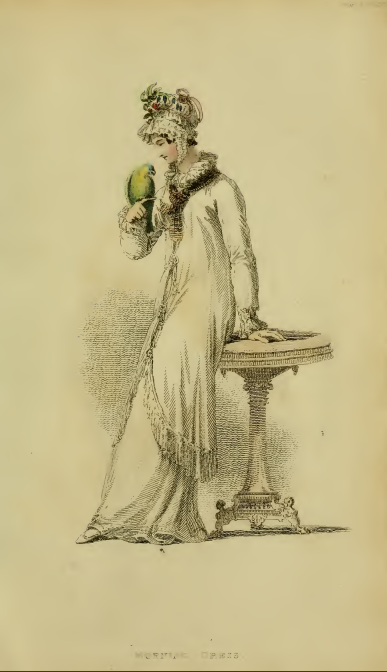 In fact, the most colorful item in either print is the yellow and green parrot sitting on the finger of the lady in the morning gown; one might be forgiven for mistaking the green ribbons adorning the lady’s mob cap for feathers plucked from her favorite pet! Her white robe of demi-length is described as a négligé (another fashionable French import due to the cessation of French/English hostilities? 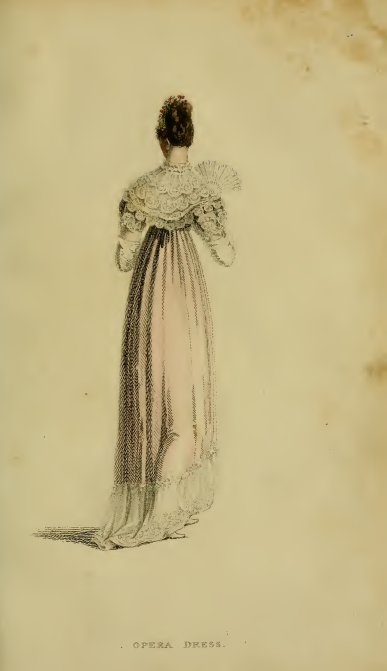 ), and is flounced with “French trimming.” The colored silk handkerchief tied “carelessly” around her neck gives the outfit a hint of informality uncommon in Regency-era fashion plates. 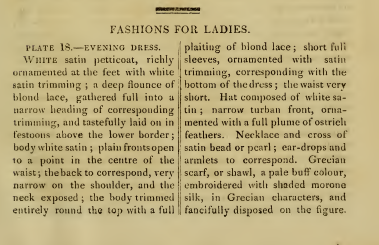 This morning dress’s négligé hides the bodice of the petticoat below, but the bodice of the evening gown dips just as low in front as in previous fashion plates featured in 1816. The white satin gown features a double hem border, the lower of white satin trimming, the upper of blond lace gathered “into a narrow heading of corresponding trimming, and tastefully laid on in festoons above the lower.” Plaited blond lace also trims the deep-V neckline, which is echoed on the dress’s back. 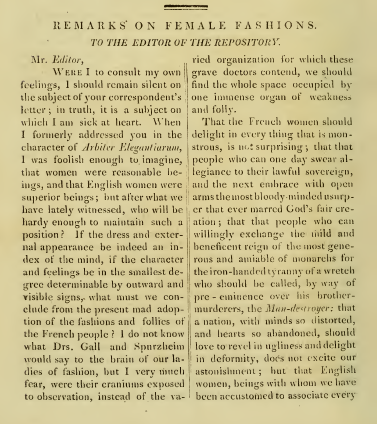 Regency women uninterested in being fashion-policed might instead sit down with this month’s Needlework patterns, two wider borders with myriad tiny leaves to occupy one’s hand and one’s mind. 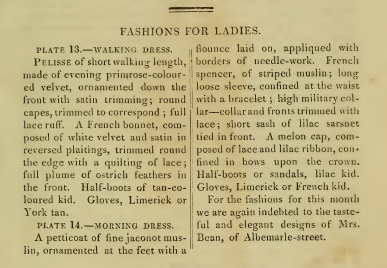 Daytime wear is the subject of March 1815’s fashion plates, which feature one walking dress and one morning dress. 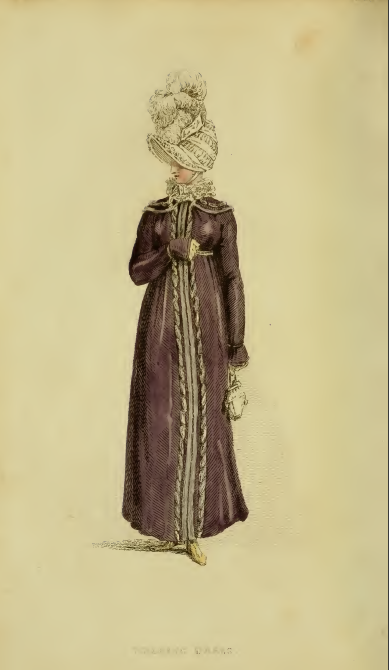 The walking dress (plate 13), departs from the previous two months’ focus on pale colors; our model here is decked out in a lush purple velvet pelisse, described as “evening-primiose-coloured.” Curled satin trim runs along each side of the front edge of the pelisse; tiny capes, “trimmed to correspond,” just cover each of the lady’s shoulders. An immense bonnet, styled “French,” looms over this wearer’s head, with an equally impressive ostrich feather topping it. I don’t imagine you would be hard to spot in a crowd if you wore that hat! 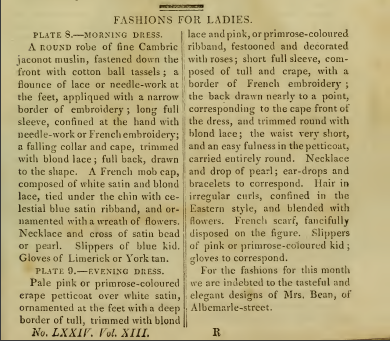 Plate 14’s morning dress is primarily white, but includes small touches of lilac to match plate 13’s evening primrose hues. 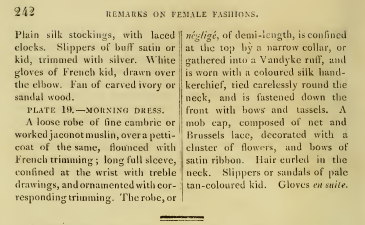 A white petticoat trimmed with borders of needle-work is paired with a striped white spencer, tied under the bosom with “a bracelet” of unspecified material. It might simply be ribbon to match that adorning the wearer’s “melon cap,” coordinated to match the lilac kid half-boots. As in the past two months’ plates, this gown’s border, too, is a deep one. 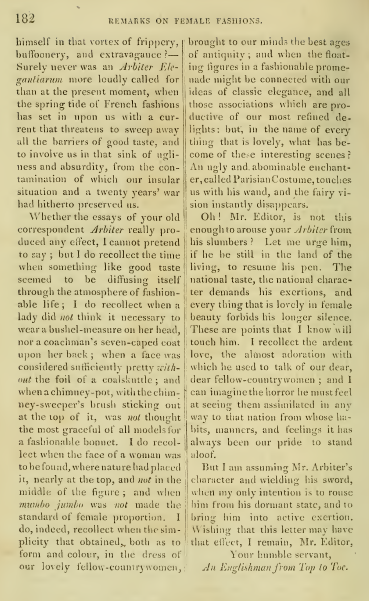 In addition to the fashion plates, this month’s Ackermann’s has the added bonus of a letter to the editor, with “Remarks on Female Fashions.” The writer mourns the disappearance from the pages of Ackermanns of Arbiter Elegantarium, who in earlier editions of the magazine offered fashion advice (and remonstrance) to the women of England. 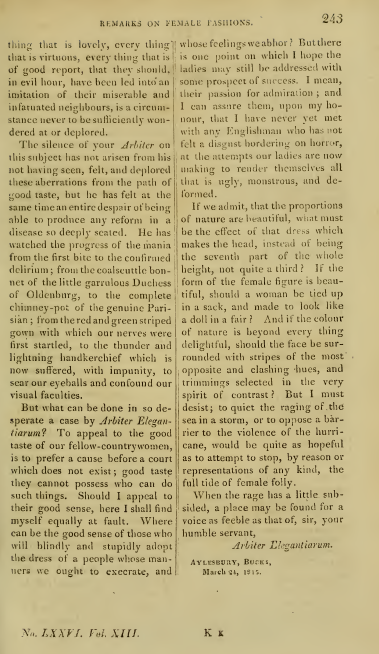 He also mourns the current trend for all things French (“that vortex of frippery, buffoonery, and extravagance”), which, due to the cessation of hostilities with France, threaten the “contamination” of English “good taste.” The writer has a special abhorrence for overly large hats (of the type featured in plate 13), and the move away from the simpler lines of dresses of the earlier Regency period, ones that more closely mirrored “the best ages of antiquity.” So amusing to read these deprecations against fashion, especially when placed right next to the plates that extol such dress! 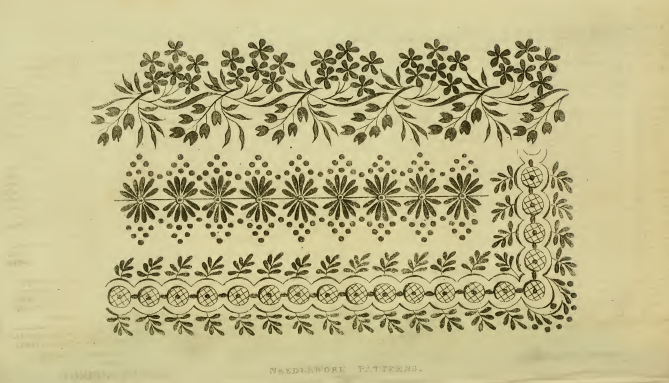 The magazine ends with several needle-work patterns for narrow borders or edgings. 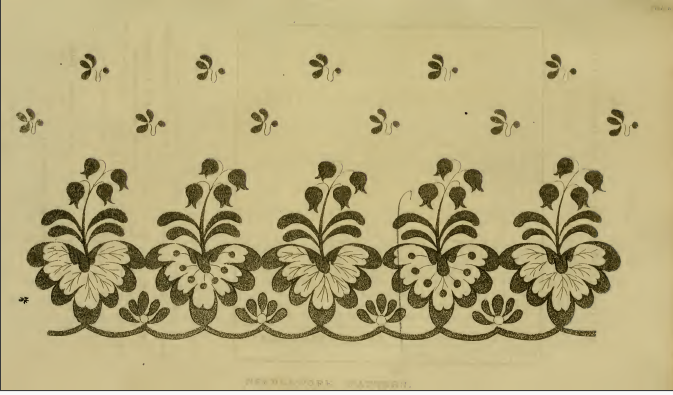 Perhaps some were used to make the embroidered embellishments on the flounce of the morning dress in plate 14? 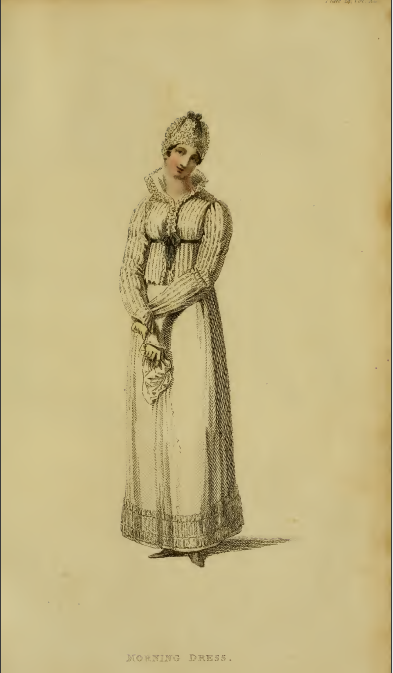 February 1815’s plates feature one dress for daytime wear, and one for the evening. 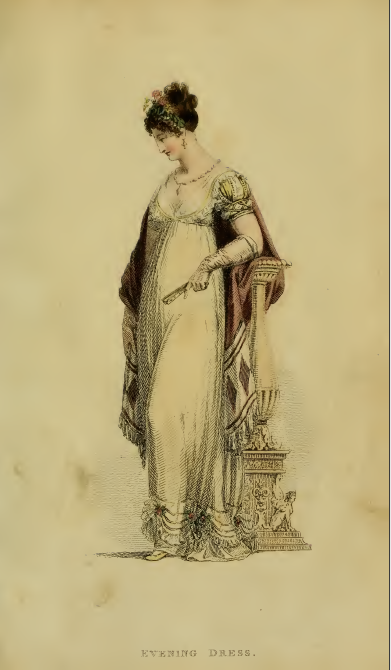 Like January 1815’s gowns, this month’s Evening Dress (plate 9) features a pale-colored gown with a deep border, although this border so quite elaborately trimmed, with “blond lace and pink, or primrose-colored ribband, festooned and decorated with roses,” you can barely tell there’s a border under there at all. I’m also struck by how small the bodice of this gown is; either its wearer is extremely small-bosomed, or low-cut bodices are becoming ever-more in fashion. The pedestal upon which the model leans is a nod to the increasing trend towards Grecian forms in furniture. The “French scarf, fancifully disposed on the figure,” almost gives this model the air of a royal. 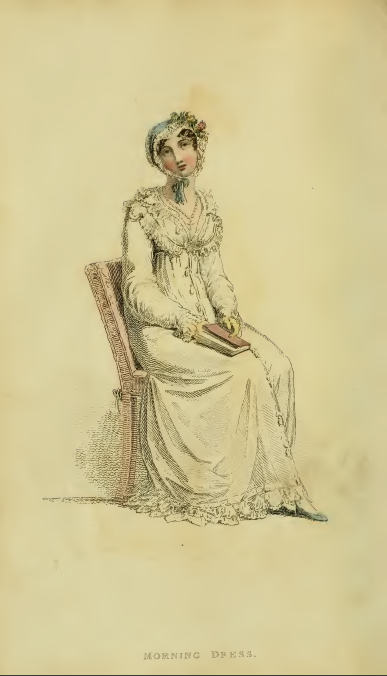 My planned short break from Regency fashion plate blogging extended into a month and a half-long hiatus, due to illness, holiday planning and travel, snowstorms, and a cold snap with several days of no heat in my house. 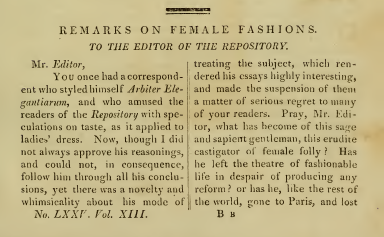 But now that 2018 is underway, I’m determined to get back on a regular blogging schedule, bringing you the fashion plates and descriptions from Ackermann’s Repository from 1815 and 1816. 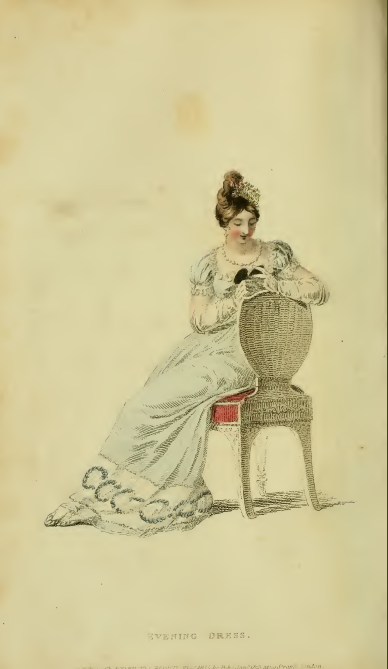 Ackermanns opens its 1815 year with two pale-colored dresses: a full dress in celestial blue, and an evening or opera dress in light pink. 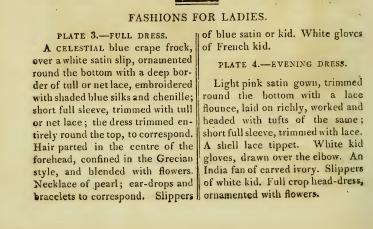 Both dresses feature wide bottom borders—a new trend for 1815? Both borders are white, the celestial blue dress’s embroidered “with shaded blue silks and chenille” in a pattern of circles or wreaths, the light pink’s plain, but edged on top and bottom with tufts of lace. My fingers itch to reach out and touch these two different embellishments, don’t yours? I’m intrigued by the accessories featured in these prints. Nothing in the copy describes what it is that the young lady in plate 3 is holding. Is it something like a modern-day compact, which would hold a small mirror and face powder or blush/rouge? Or is it more likely to be pair of linked painted miniatures, perhaps of the owner herself and her beloved? Or of loved ones now departed? 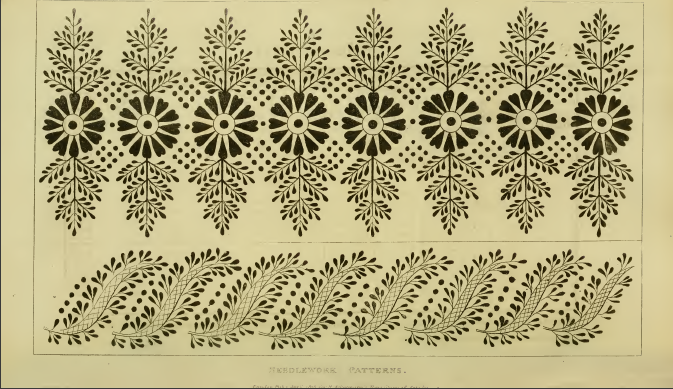 The copy for plate 4 does describe its unusual short cape, as a “shell lace tippet.” I wonder if the tippet was knit, crocheted, or tatted? I can’t recall seeing anything like it in any fashion plate of the period I’ve seen before. The new year brings a return of the fabric sample page at the issue’s end. Only three samples instead of four, and only two intended for dresses. Interestingly, where the fashion plates both feature light colors, all these fabric samples are on the darker end of the color scale. I have to say that I don’t find the first sample, No. 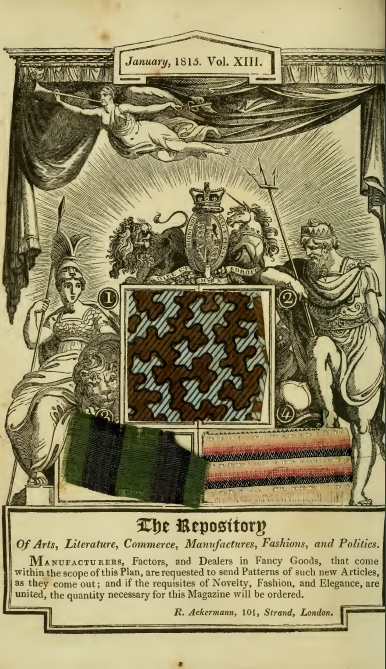 1/2, intended for furniture upholstery, all that appealing, despite the description’s terming it “choice.” Sample 3, which is recommended for morning or domestic wear, is a more appealing black and green striped “tabinet,” a fabric that Fairchild’s Dictionary of Textiles reports is “a poplin produced chiefly in Ireland, made with silk warp and wool filling and given a moiré finish” or, more simply a “thin taffeta with a moiré finish” (558). 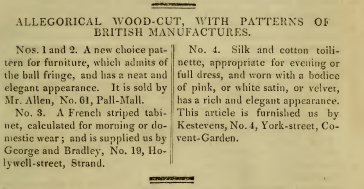 Sample 4 is also a blend, this time of cotton and silk “toilinette,” which Fairchild’s explains is “a plain, figured, or printed fabric made of silk and cotton warp with a woolen filling” which was popular during the period for women’s dresses and men’s vests. Can you say “tabinet and toilinette” ten times fast?